Yesterday’s post on campaign furniture in the kitchen reminded me that I hadn’t shared this easy DIY yet. These photos are old in-progress shots from an eDecorating client. And 16 of these brass corners (they’re about $5 for a set of eight) and just tapped them into the very outside corners of the tables (tops and feet). So easy and very inexpensive! 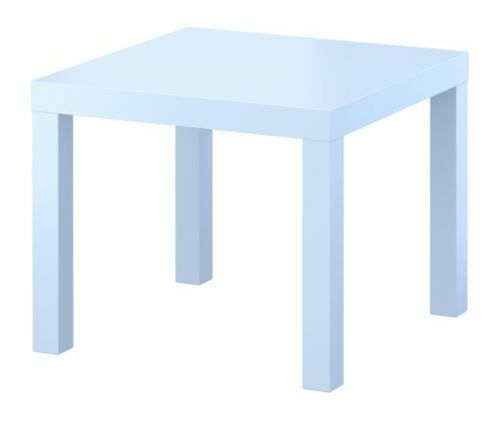 It looks like the light blue Lack table is not available any more, but there are some very pretty high gloss versions at IKEA now. (Wouldn’t the birch be just gorgeous with the brass? Or that glossy gray!) Prices range between $7.99 and $12.99 each, which is about the cost of a sandwich here in NYC. Not too bad for a pretty and unique version of a classic Parsons style side table. Pam – I'm pretty sure we used Gray Owl? I need to get the finished room photographed soon. There were some additions and changes (like there always are!) but last I saw everything was amazing. Actually, I should see if the owners would be up for a full house tour. You would DIE over how cute this home (and the home owners) are. Quidessetial New England seaside town. Makes me miss Boston! Gorgeous, I want to do this! Jenny, You're full of the best ideas! Thank you so much for sharing them with us. Now that's a great hack. Talk about making them look high end with those brass accents. Nice job. You never cease to amaze me. Love this! LOVE IT- what a fabulous, simple, cheap idea- so much impact!i might hav eto pick up a table or two at my Saturday Ikea trip… and I love the arm chair- I just bought that fabric and am reupholstering some dining chairs in it- it's so pretty! Thanks for the tip, Jenny! Think I'll use this in a nursery I'm designing. Such a great, cheap and easy facelift to a classic. Thanks! wow! isnt that amazing how a little jewelry can glam up a piece of plastic! LOVE this idea! I LOVE that whole room! And the tables turned out adorable! I would love to see more photos of that room! Would you mind sharing the wall color? Oh my goodness! I'm dying for the dark gray with brass! Fabulous hack!! love this! 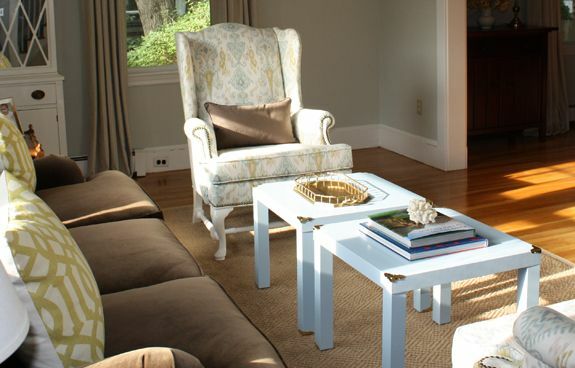 And really, really love that arm chair! Ashley – The link is there in the post. You can also google 'brass furniture corners' if the ones on Amazon sell out today. Isla – The fabric is Robert Allen's Khanjali in Glacier. You can buy it at L&S and other places. Alex – You're going to want to use little brass brads (available at any hardware store) or the brass screws that come with the plates. The plates won't stay on otherwise. Good luck! This looks SO easy. You can do this to any piece of furniture not just tables. LOVE! You are so creative. How do you think of this stuff? And, they look fabulous! AMAZING! 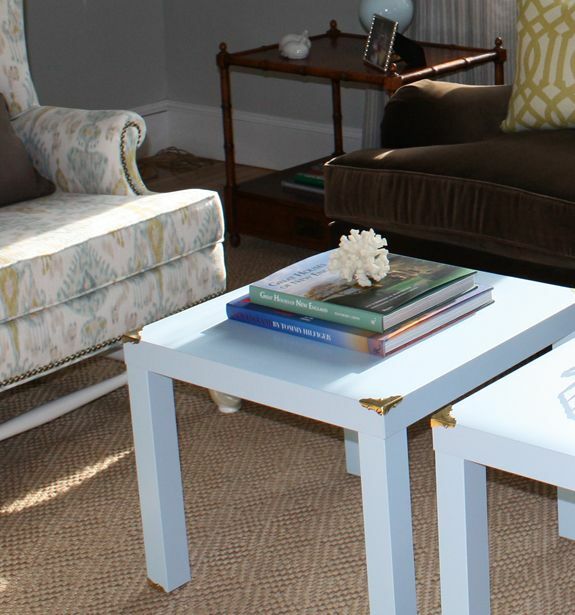 I am so in love with this idea… I have the birch lack tables as side tables in our master bedroom. I was just thinking they needed a little something to spruce them up, this will be amazing! As always you never disappoint with your simple and down to earth style. LOVE IT! They look great! I love the green table. I'm on a green kick lately. How gorgeous! I have been on the hunt for some of the campaign style hardware…can I ask where you found that at such a fantastic price?! Love this idea! I've seen people do it with the corners of their shelves too and the outcome is awesome. I also love those lack tables if you buy two and use the top of the second one as the bottom on the first- kinda like an open cube. It would be great with those brass corners too! A triple clever. I think the birch tablecwould be fab! I think with woven baskets underneath, these would make really cool bedside tables. Love it! This is GREAT. I am so copying you. Thanks Delia! The hutch in the background and the two bamboo side tables were thrift store finds. Can you believe it? There are great thrift stores in Boston! Are you kidding me? this is a great idea! inexpensive too. I'm definitely doing this! GREAT room! 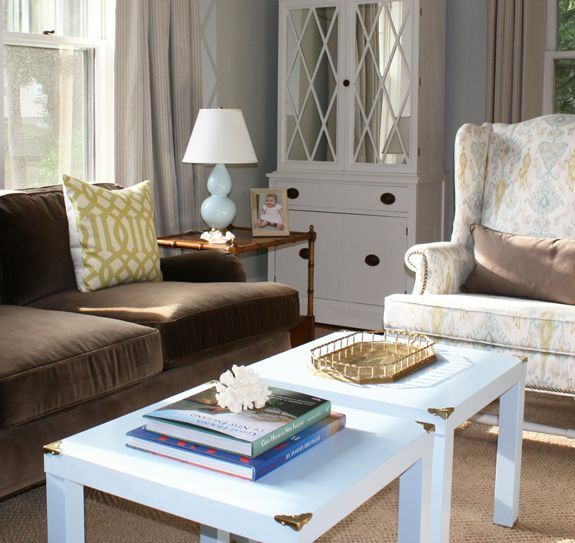 I love LOVE the Ikat fabric on the armchair. Do you know what it is? It would be perfect for a chair I need to get recovered. I have two Lack tables being used as a coffee table, too! Hadn't thought of the edge pieces though. I would love to take the Ikea look away a little. just bought the corners to use on my white Lacks! Can you tell me if you actually hammered in the little screws, or just sort of molded the brass around the corners using a hammer? I love this! It's DIY without really having to even do anything. Love your blog! Jenny, is that the home depot carpet you blogged about previously? I totally bought those brass corners on Amazon. I'm either going to use them on LACK tables or fancy up a chest/box. Brilliant! We have 4 black lack tables and this would be an inexpensive way to spruce them up a bit until we can afford new nightstands and side tables (: Thank you for the inspiration! You are fantastic – a fave blogger for a long time! Love all your posts. Love, looooooove. I am looking forward to crawling in the bed and reading your posts every night before I fall asleep. Love them. What a great idea! Whoa – what a difference those tips make! So lovely! You are so creative, those tables look awesome and expensive, I love this! These are so pretty, but realistically, a lack table won't withstand much wear and tear. Perhaps finding vintage, solid wood tables with clean lines would be a sturdier approach. Brilliant! And, finally a diy that I think I could almost do!yay! Best idea evah! Totally hacking all my Ikea furniture with this idea. Jenny, I love this idea!! Great DIY! Hi Jenny! You said you taped on the brass corners. What kind of tape did you use?? Did this today! Thanks- love it! an old post but still a goodie. 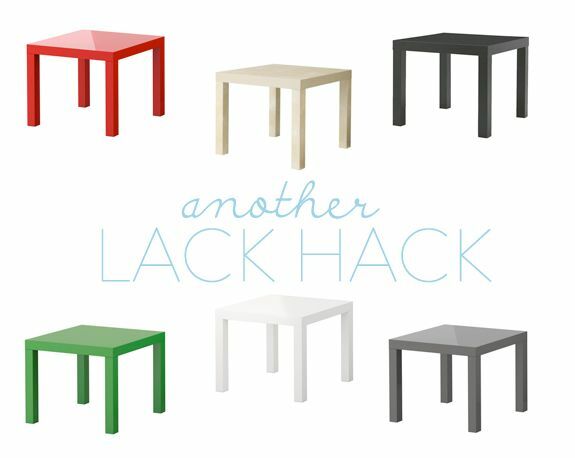 i'm def going to do this to my IKEA lack tables. give it some new life. thanks for the great idea!